Ok, since I have time to blog again, now I'm back in the ranting mode. People compare this series to Spice and Wolf because they're both supposed to be about economics. Having seen six episodes so far, I think that analogy is generally on target, but slightly off the bull's eye. For one, Spice and Wolf deals mostly with micro economy, where Maoyuu has more to do with macro economy. On top of that, you can technically call it economy, but more accurately, it should be described as a "how to" guide in effectively managing and running a medieval style country. Having said that, however, I have to say that I'm definitely seeing the spirit of Spice and Wolf here in Maoyuu Maou Yuusha. The flow of the story, how characters relate to each other all have this pretty familiar vibe to it, though S&W is a bit more subtle whereas Maoyuu is just out right blatant when it comes to the subject of love and relation between the main characters. 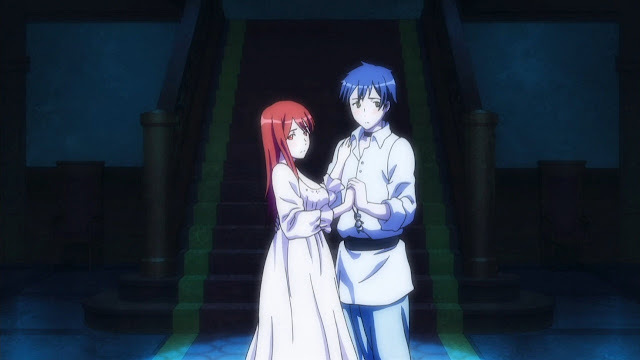 I didn't see Spice and Wolf, but Maoyuu Maou Yuusha gives me the same feels as Sword Art Online.